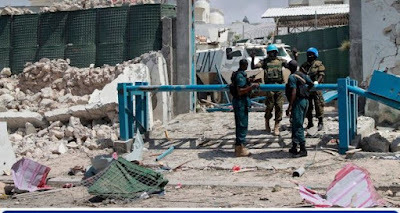 Suicide bombers killed at least 13 people at the gates of the African Union's main peacekeeping base in the Somali capital Mogadishu on Tuesday, police said, in an attack claimed by the Islamist militants of al Shabaab. The force of the explosions shattered windows at the nearby airport, showered arriving passengers with glass and forced the suspension of flights, police and witnesses said. were wounded, Abdiqadir Omar, a police officer told Reuters. fighting to topple Somalia's Western-backed government, said it set off two car bombs. The African Union's AMISOM force said on Twitter it condemned the "senseless attacks that aim to disrupt and cripple the lives of ordinary Somalis". There was no immediate comment from the United Nations.